Indonesia Tours Packages - Living in over 17.508 islands, the current Indonesian populations is more than 200 million peoples includes more than 200 ethnics. The majority of Indonesian citizens are Muslims, while Hindu religion is dominant in Bali. In the other regions such as Minahasa in the North Sulawesi, Toraja highland in the South Sulawesi, Nusa Tenggara island, and the most of Papua regions, Batak highlands and also Nias island in the North Sumatra, the majority of citizen is Catholics and Protestants. Pancasila is the Indonesia state basic philosophy that brings the society on tolerances toward any religions, customs and traditions. It was reinforced by the motto “Bhinneka Tunggal Ika (Unity in Diversity)” which means “despite different but still be one”. Although the young generation in the big city lives modernly and follow the world’s trend, they still perform the marriage ceremony traditions of their parents in the marriage matters. For many centuries Indonesia has been influenced by the culture of Chinese, Indian, Arabic and European. 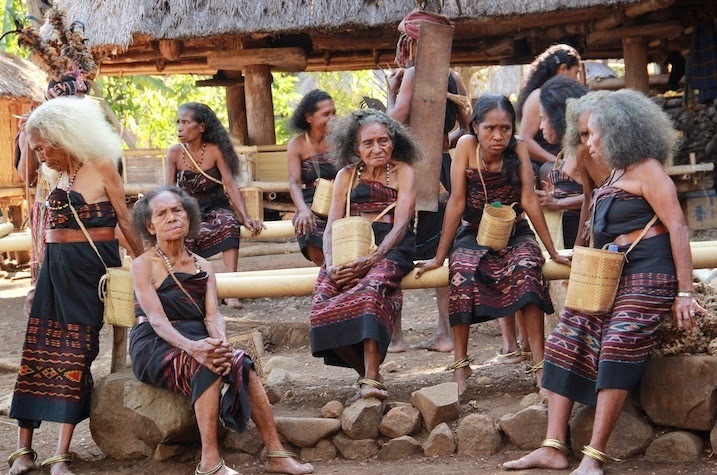 But, Indonesia still has many ancient cultural roots, especially in the littoral area. And in the last few decades, the global popular culture include the internet has a big impact on the society’s way of life. On 2nd October 2009, UNESCO had admitted that Batik Indonesia as a World Cultural Heritage object, following the Keris Indonesia and Leather Puppets that had been previously admitted. Then, Angklung was following to be confessed by UNESCO on 18th November 2010 as a World Cultural Heritage. Recently, the original Saman Dances from Gayo Lues, Aceh was also confirmed on the List of Intangible Cultural Heritage in Need of Urgent Safeguarding UNESCO on 24th November 2011. Indonesia is rich in arts and crafts. In the field of textile, some of the best textiles from a natural fiber with complicated motifs can be found in Bali and Flores. While, Sumatra produces a typical cloth named 'songket', woven gloves made ​​of the best gold and silver. There is also a colorful woven silk from the South Sulawesi. In a wooden craft, the ship maker from Bugis in the South Sulawesi continue to build a great sailing ship named “Phinisi” that is still used in the Indonesian seas to this day. The craftsmen in the Central Java produce smooth furniture carvings. While, the craftsmen in Bali produces many beautiful sculptures as well as the Asmat tribe in Papua. They don’t only produce traditional works, but also a modern one. Various differences of the culture and tradition in all over Indonesian regions are also stated in many interesting events, both the religious events and famous events held throughout the year. (Look up the Event Calendar).You can see the government’s procession during Sekaten in Yogyakarta, the religious ceremony of Hindu Dharma that continuously held in Bali, and the Tabot Festival in Bengkulu. Don’t forget that there is also the Buddhist Wesak ceremony that is held every year in the Borobudur Temple. There is also a Kasada ceremony that is held in the end of the year in the Bromo Mount, the East Java. It is purpose to appease the ancestors’ souls and the God. Besides that, you can also watch the Feast of Death that is held in Toraja, Sulawesi Island. And the most popular event that becomes the main event is “Nyepi”. It is the festal day for the Hindus in Bali and it is also a meditation day which all the lamps, fires, sounds, include the planes and cars are forbidden to operate for 24 hours. Nyepi is becoming an international tradition that can decrease the pollution and global warming. Then, there are also some celebrations in the form of tribal war in the Papua Wamena Valley, a bull race in Madura that is held as the thanksgiving after the harvest, and “Nyale” festival in Lombok, a festival that is purposed to look for marine worms in February, and many more events held in the entire island. Indonesia is rich in art shows. The beautiful Ramayana Ballet is performed on the dry season in the Prambanan Temple’s courtyard and full of moon lights. Indonesian dances are very diverse, dramatic and entertaining. Starting from the synchronized dance that is Saman dance from Aceh until the graceful dances from Java that are together with the Gamelan sounds, or the war dances from Kalimantan, Papua and Sulawesi. The Chinese influences can be seen in along the Java North Beaches, starting from the motives of Batik Cirebon and Pekalongan until the furniture and the smooth door carvings from Kudus, the Central Java. There is also a gold embroidered wedding dress that is beautifully designed from the West Sumatra. Indonesia is not merely a cultural heritage. Currently, in the field of music, in the capital Jakarta, the Java Jazz Festival became an annual event for jazz music for both the Indonesian jazz musicians and abroad. Indonesia is also proud to have some of famous bands, and the best rock and pop singers. There are some famous bands like Nidji, Ungu, Slank, and solo singers such as Iwan Fals, Rossa, Anggun, Agnes Monica, Krisdayanti, Ari Lasso, and many others. They never fail to make a sensation on the stage, even they’ve entertained their fans include the fans from the neighboring countries like Malaysia and Singapore.